Dr. J. van der Hoeven Leonhard, Amsterdam (acquired from the artist by 1912). Mrs. Liencke Woltjer-van der Hoeven Leonhard, The Hague (wife of the above); estate sale, Christie's, Amsterdam, 13 December 1989, lot 191. M. Seuphor, Mondriaan, Life and Work, New York, 1956, p. 415, no. 130 (illustrated, p. 366, pl. 11, no. 109; dated circa 1905, as Moulin vent). M.G. Ottolenghi, L'opera completa di Mondrian, Milan, 1974, p. 94, no. 109 (as Mulino a Vento). R.P. Welsh, Piet Mondrian, Catalogue Raisonn of the Naturalstic Works, New York, 1998, vol. I (until early 1911), p. 321, no. A415 (illustrated). The view depicted here is of the so called 'French-mill' on the Gein, one of the two remaining large windmills built in the last century, in the 17th century style. The Gein is a small river that meanders through the beautiful countryside outside Amsterdam. The view of the mill appears in a group of paintings that can be dated 1905-1908. The position of the mill, however greatly varies depending both on the point of view chosen and on the position of the sails. Thus for Mondrian the mill on the Gein was an important motif for experimenting with new pictoral means. 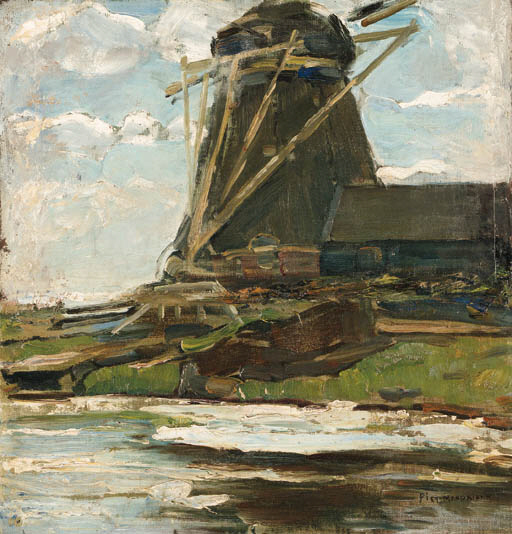 In 1919 Mondrian said about the motif of the mill "I find this windmill very beautiful. Particularly as we are too close and therefore cannot see it or draw it normally...I tried to represent things seen from close by, precisely because of the grandeur they then attain..." (P. Mondriaan, "Trialoog," De Stijl 2, 1919, p. 16).